The US Director of National Intelligence has said he did not know what happened in the one-on-one meeting in Helsinki between US President Donald Trump and Russian President Vladimir Putin. Republicans and Democrats in Congress are seeking answers on what agreements Mr Trump may have reached with Mr Putin in their two-hour meeting on Monday in which they were accompanied only by their interpreters. The White House has faced an uproar over several issues from the summit, including Mr Trump's failure to confront Mr Putin over US intelligence agencies' findings that Russia meddled in the 2016 US election and Mr Putin's proposal that Russian authorities be allowed to question US citizens. "Well, you're right, I don't know what happened at that meeting," Dan Coats said at the Aspen Security Forum in Colorado. "I think as time goes by, and the president has already mentioned some things that happened in that meeting, I think we will learn more. But that is the president's prerogative," Mr Coats added. He also learned of Mr Trump's decision to invite Mr Putin to Washington for a second meeting this autumn while he was being interviewed at the Aspen forum. "OK," he said to laughter. "That's going to be special." On the prospect of Mr Trump and Mr Putin holding another one-on-one meeting with only their interpreters, Mr Coats said: "I would look for a different way of doing it. Russia is ready to discuss the proposed new meeting between the two leaders, the Interfax news agency cited Russia's ambassador to the United States, Anatoly Antonov, as saying. At a post-summit news conference with Mr Putin in Helsinki, Mr Trump responded to a question about Russian meddling in the 2016 US presidential election by casting doubt on the findings of his own intelligence agencies and denouncing the "stupidity" of US policies. Mr Coats immediately responded on Monday by releasing a statement firmly supporting US assessments that Russia was involved in "ongoing, pervasive efforts to undermine our democracy". 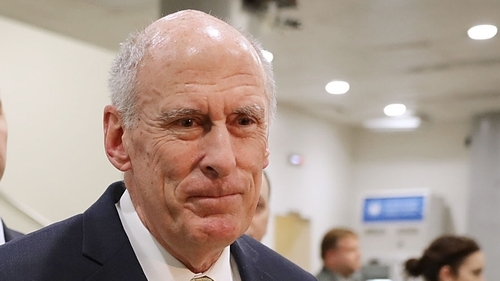 Asked about what he thought when he heard Mr Trump's statements at Helsinki, Mr Coats said: "Well, my thoughts there were that I believed that I needed to correct the record for that. "Obviously, I wished he had made a different statement, but I think that now that has been clarified." Mr Trump then said on Tuesday that he misspoke during the news conference and accepted the intelligence agencies' conclusions. He has called the summit "a great success," but he has been vague about what he discussed with Mr Putin.